Since I began working at Delicious Media I’ve become more aware of just how open and welcoming the WordPress community is. Whether it’s online or at MeetUps and other events, it seems that that people are always happy to share knowledge and give support; something that has been very valuable to me as a new web developer. 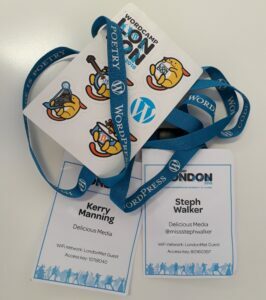 When Steph and Dave announced that we’d be attending WordCamp London 2018 I was really excited at the thought of getting involved and connecting with a wider portion of the WordPress users out there. As a first time attendee the weekend felt like a bit of a whirlwind: the volume of people to meet, knowledge to take in and ideas to mull over was a little overwhelming. Not to say that it wasn’t a lot of fun too! The organisers did a great job of making it a welcoming experience and the opportunities to meet people during breaks and the Saturday social were much appreciated. There’s nothing like chatting over a cup of tea (or a beer) to bring folks together! The community feeling of the event was especially evident at these times; I found myself chatting to a wide range of people, some that were giving talks or had long and illustrious histories in WordPress, without feeling left out, or out of my depth, as a newbie. The range of talks was really interesting and I liked that some were in depth while others were shorter ‘lightning’ events – the variety was engaging. It’s hard to condense such a wealth of experiences but, after some consideration, these are my top three takeaways from the weekend. Learning more about the future of WordPress. Tammie Lister’s talk, ‘Anatomy of a block: Gutenberg design patterns’ was a good introduction to the new Gutenberg editor and the mention of block control (making blocks un/available depending on the current template or user) was particularly interesting! 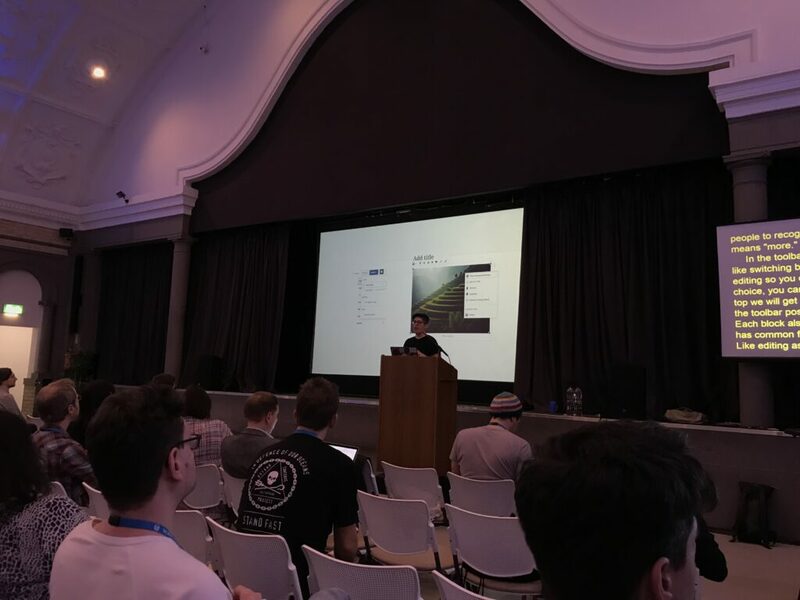 To compliment this, Zac Gordon’s session ‘Gutenberg Development with React’ packed in loads of information and inspiration for getting started with Gutenberg as a developer. I first began learning WordPress online through courses presented by Zac, so it was great to hear him speak in person! Introduction to new tools (or new ways to implement ones that I’m already familiar with). Many speakers shared tools and methods that they use to streamline or augment their development processes which gave me lots of food for thought. In particular, Thorsten Frommen’s talk, ‘An Introduction to Unit Testing (for WordPress)’ provided lots of helpful ideas and examples. Further insights into web accessibility. Maja Benke talked about ‘Accessible Design’ and as a dyslexic herself, she had some interesting personal experiences to share, along with lots of valuable knowledge. Sarah Semark’s talk ‘Empathy for Introverts’ was also thought provoking, showing how approaching design from an inclusive perspective can result in valuable innovations. I also saw Sarah talk at Front End North earlier this year and I really enjoy her presentation style, bringing together a range of resources that show familiar subjects in a new light.3a. Massive slices of cake! With so much to take in I was very much in need of a boost by late afternoon on both days. As a result, I think the cake break deserves this mention on this list, if not quite its own entry. While it might take me a bit of time to decipher my notes (writing fast and neatly is not my forte!) I’m keen to implement some of the knowledge I picked up over the weekend. And of course, I hope to stay connected to people I met and look forward catching up with them at my next WordCamp experience!